Having already looked at selected works in Part 1 of my report on Perspectives 178: CINEPLEX at the Contemporary Arts Museum Houston, I want to discuss the exhibition's layout and presentation. Sounds exciting, right? The truth is, I can't remember seeing a show that left me pondering the presentation of the work as much as CINEPLEX. It's a video show, but it's unlike any video show I can recall. This is my attempt in understanding its unique setup. Typically, video pieces require more from their presentation than other kinds of art. They change over time and aften make noise. To adequately present such works while being respectful to the works around them, they are usually isolated in some fashion. They may be placed in a separate room, for example, or tucked away in a darkened corner, or (shudder) presented with accompanying headphones to muzzle the audio component from the rest of the gallery. 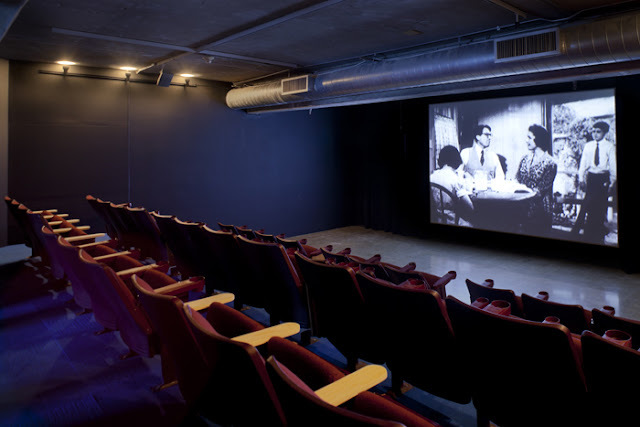 CINEPLEX shows signs of this traditional approach by placing the four works in the common space on separate walls and the fifth piece in a custom-built, 46-seat theater. 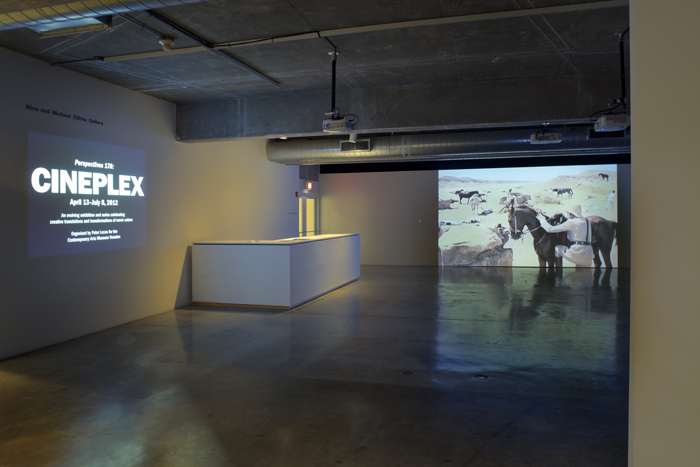 However, CINEPLEX also flies in the face of that tradition by making Les LeVeque's stroboscopic white and fifteen movies starring Charlton Heston – the most difficult piece to actually look at – the largest in the exhibition and placing it directly opposite the gallery's entrance. It is a bold, aggressive act by curator Peter Lucas that clearly signals a departure from the norm. As described in Part 1, LeVeque's work is constructed from a sequence using two frames from a Charlton Heston movie followed immediately by two frames of white, and so on. For reference, you can see a clip of the film here. Being as large as it is in the space, the strobing light emitted from the work reflects on pretty much everything, including the walls displaying works by Gustaf Mantel, Frederick Brodbeck, and Christian Marclay. The piece also has an audio component. So even when you're not looking at white and fifteen movies starring Charlton Heston, its presence is seen and heard while viewing the other works. I asked a gallery attendant if there was a break between cycles of the 15-minute piece (perhaps hoping for some familiar stillness), but there was no such reprieve. A few days after my second visit to the gallery, I emailed the CAMH asking for images to use in these posts. I also sent along a question about white and fifteen movies starring Charlton Heston for CINEPLEX curator Peter Lucas. I was now very curious about the scale and placement of the work. I mentioned that I, personally, found it hard to "escape" the strobe effect when viewing the other pieces on display outside the theater. Was this an intentional effect, and if so, why? 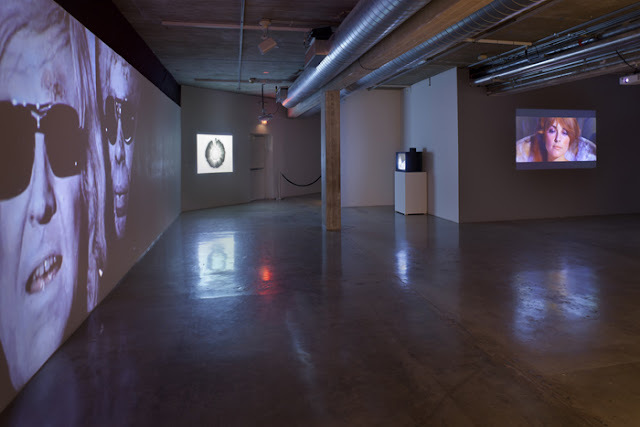 "Les LeVeque’s video was intentionally placed and sized to be prominent upon entering because its rapid collage of multiple movie frames and white frames immediately says something about the nature of cinema and our perception. 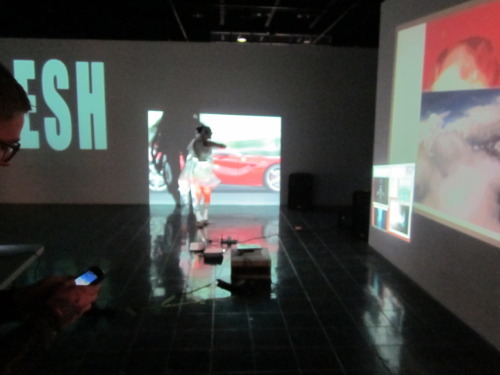 It was my intention for the main gallery space to include a variety of approaches to movie manipulation; for the quartet of works in that space to contrast, overlap, and interact; and for the experience of the gallery space to be strikingly different than inside the central cinema space. The gallery is meant as a more aggressive, flickering, kinetic, and de-centered environment, while the theater space has the comforts of traditional cinema presentation environment (black curtains, seats, soft or no light, and one central screen)." I appreciate having an understanding of the story or design decisions behind an exhibition, particularly when the exhibition concept is as challenging as this. Wanting to have the works in CINEPLEX's common area interact and overlap is a very meta approach to an exhibition about repurposing, manipulating, and remixing. It's a bold idea, but the execution is holding back. For starters, LeVeque's work owns the space. While its reflected strobing light and audio score interact with the other three works, none of them can really reciprocate. Brodbeck's Cinemetrics and Mantel's animated movie GIFs are less than 1/4 the size of white and fifteen movies starring Charlton Heston, and neither has its own audio component. LeVeque's score steps in, however, providing an unofficial audio track while viewing these smaller pieces. While it sort of works with Brodbeck's pulsating cinemetric, I don't find it to enhance the quiet nature of Mantel's pieces in any way. Marclay's Telephones is the smallest piece in the set, presented cleverly inside an old Trinitron television. It does have audio (mostly talking and telephone ringing) which occasionally cuts through the LeVeque score. When it does, this is probably the best moment for pieces in the common area to truly interact on level footing. Yet LeVeque's and Marclay's pieces are on opposite walls and pushed down from one another (as you can see in the photo below), making it impossible to view the pieces simultaneously. Mr. Lucas's response to my question also made me think about artist Rafaël Rozendaal's BYOB series. The last "B" is for beamers, as in projectors. These one-day only events either feature a curated collection of artists or an open call, and participating artists are responsible for bringing their own video or animated works – and their own gear – to the space. One of my favorite aspects of the CAMH is that it often takes risks with its programming, and I find that to be the case with the unusual presentation of CINEPLEX. It's a great show, worthy of repeat visits. (I've been four times now.) Clearly, it's prompted a lot of thought from me on the work and how such work could be displayed. I don't think there's anything more that one can ask for from an exhibition.